Pumpkin Chocolate Chip Muffins | Whole Food. Real Food. Good Food. It is that time of year for everything pumpkin! 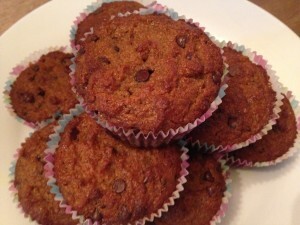 My kids wanted muffins this morning for breakfast, so we found a great grain-free pumpkin muffin recipe at PaleOMG. 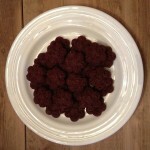 This was a great recipe to for my kids to help with and get them involved in the kitchen. I feel like they appreciate the food they eat so much more if they are involved in the process of preparing it. My four-year-old stirred all of the ingredients and my seven-year-old scooped the batter into the muffin liners. The first words out of my son’s mouth after taking his first bite was “these are awesome!” If your kids prefer mini muffins, a mini muffin tin would work great too. The recipe calls for Enjoy Life Semi-Sweet Chocolate Mini Chips, which are dairy, nut & soy free — no one in my house can taste the difference between the Enjoy Life chips and Nestle Toll House Chocolate Chips. Theses muffins are super moist just like the Entenmann’s mini muffins. I used to love the Entenmann’s Little Bites because they were convenient and an easy fast snack. 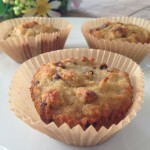 With the muffin recipe below, you can double the recipe and freeze what you are not going to use within the week and feed yourself and your family muffins that promote health rather than deteriorate health. 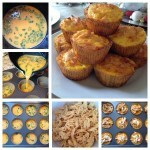 We use WEXY Lunch and Munch Snack Bags to freeze individual servings of muffins, they are biodegradable and BPA Free. You can put 3-4 muffins in the bag, freeze and grab before you walk out the door. If you are wondering what is in the Entemann’s mini muffins, here are the ingredients in the Banana Chocolate Chip version. Many of the ingredients are likely GMO. For a guide to GMO ingredients, visit this page. Banana(s) Puree, Sugar,Wheat Flour Bleached, Soybean(s) Oil, Egg(s), Chocolate Chips (Sugar, Chocolate Liquor, Cocoa Butter, Dextrose, Chocolate Liquor Processed with Alkali, Soy Lecithin, Vanillin), Molasses, Flavor(s) Natural & Artificial, Corn Starch Modified, Whey (Milk), Dextrose, Water, Fructose, Mono and Diglycerides, Tricalcium Phosphate, Baking Soda, Sodium Phosphate, Salt, Sodium Stearoyl Lactylate, Guar Gum, Potassium Sorbate, Xanthan Gum,Soy Lecithin, Sorbitan Monostearate, Polysorbate 60, Calcium Sulphate (Sulfate), Soy Protein, Calcium Phosphate. Line a muffin tin with paper liners. Use an ice cream scoop to one scoop of batter per muffin. Makes 5 full muffins. 2. Mix together wet ingredients in a bowl: pumpkin puree, maple syrup, coconut oil, eggs, and vanilla extract. 3. In another bowl, whisk together coconut flour, cinnamon, nutmeg, ground cloves, powdered ginger, baking soda, baking powder, and salt. 4. Pour dry ingredients into wet ingredients and mix well. 6. Line a muffin tin with paper liners. Use an ice cream scoop to one scoop of batter per muffin. Makes 5 full muffins. You read my mind. I have been waiting for a pumpkin recipe from you. I will make these today!!!Thanks. Coconut flour is unique in that it soaks up a lot of liquid. 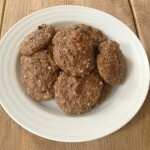 If you used almond flour you may want to eliminate one of the eggs. I am honestly not sure how they will turn out. If you try, please let me know. Thanks!